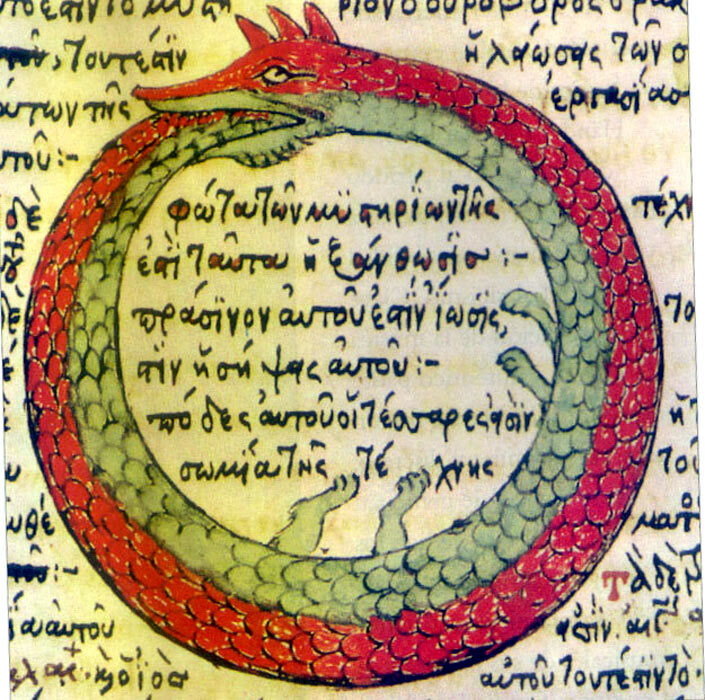 Ouroboros, or the serpent which bites or swallows its own tail, is a well known symbol in esoteric doctrines. It is a symbol for death and rebirth, renewal of life, and also a symbol for the cosmos or endless cycles in the universe. 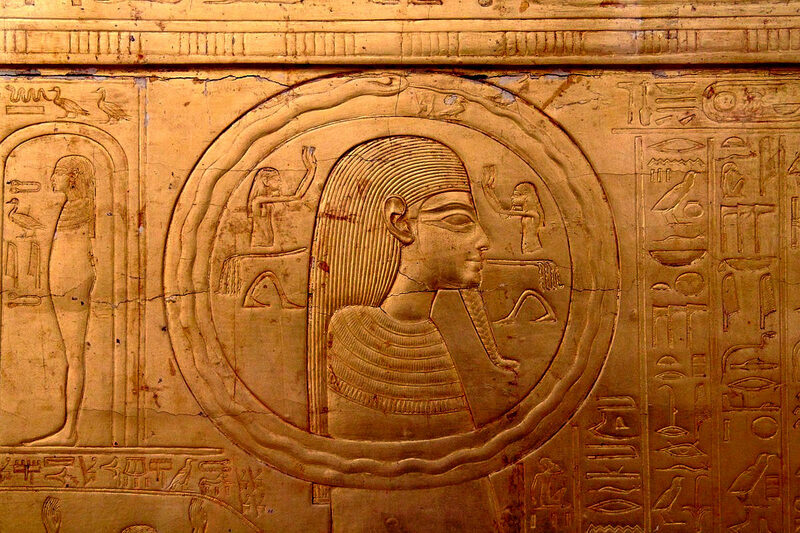 The first known appearance of the ouroboros motif is in the Enigmatic Book of the Netherworld depicted on the second gilded shrine of Tutankhamun. It dates from the 14th century BC. Tutankhamun was the son or grandson of Akhenaten. The Akhenaten family, who all had elongated heads, had broken with a long tradition of a multiple gods pantheon, that had become a very profitable business for the priesthood. Akhenaten (and Nefertiti) broke with a lot of traditions, They established a new capital in a place they called Akhetaten (now called Amarna), away from the control of the priesthood. Their art style broke with long established Egyptian conventions. Unlike the strict idealistic formalism of previous Egyptian art, it depicted its subjects more realistically. Most important is that they replaced the multi-gods pantheon with a single sun god, representing the inner divine self in each one of us. Akhenaten, Nefertiti, and Princesses Meretaten, Mekeaten, and Ankhesenpaaten worshiping the Aten as a family. Tutankhamen’s tomb is very unusual. It is too small for a royal tomb. Recently it has been suggested that there are two more chambers which were sealed off and painted over. It is quite possible that this tomb was originally the tomb of Nefertiti, and that the priesthood moved the mummy of Nefertiti into those back rooms, sealed of their entrances, and used the tomb for the mummy of Tutankhamen. It has also been remarked that the chaotic way the furniture and other funerary objects were placed in the tomb, shows that they were dumped rather hastily, and not in accordance with the usual respectful burial rites. 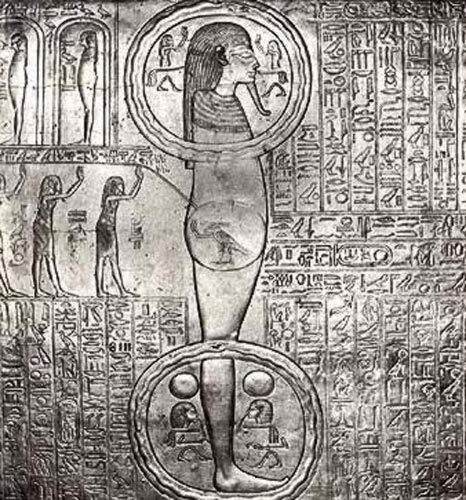 Furthermore there is also evidence that a lot of the objects originated from a female pharaoh. It is quite possible that most of the objects belonged to Nefertiti, and that they came from the palace in Amarna. The priesthood hated the Akhnenaten family so much that after the death of Tutankhamen, they broke down the entire Amarna palace to its foundation. So, it is possible that they dumped the palace furniture into the tomb at Nefertiti’s death or at Tutankhamen’s death. 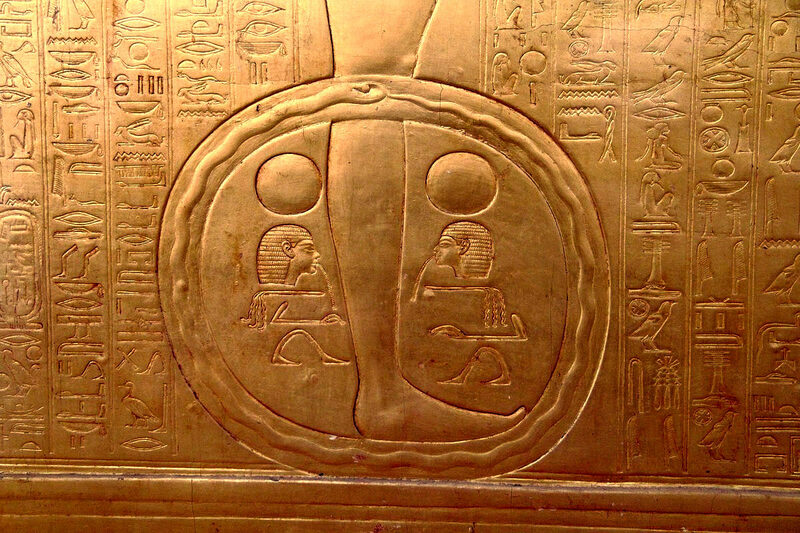 Knowing that the Akhenaten family held a different belief system, it is quite interesting that a new symbol shows up in the funerary text on the second golden shrine of Tutankhamen. 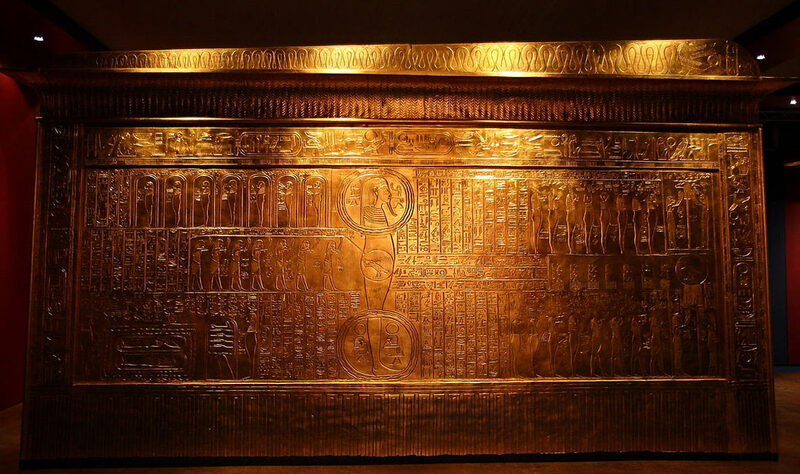 The outside of the second gilded shrine shows scenes and text that are part of a netherworld book that is rather unique and cryptographic. That is why it is called the Enigmatic Book of the Underworld. The texts which accompany some of the illustrations are cryptographic in order to preserve the secrecy of the formulas. We find this also in some some of the Ramesses tombs. The different underworld texts where not only a guide for the deceased soul, they were also used for initiatory purposes. Of course, they required an initiate or priest to explain or interpret the correct meaning of the symbols and text. That is why modern day interpretation of theses funerary texts is only sketchy and superficial. 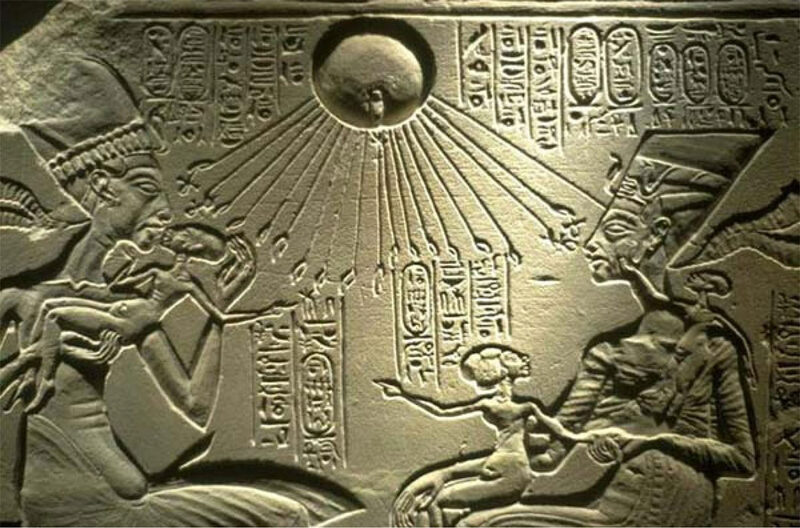 The scene and text shows a strong relation to the death and rebirth of the sun, which is of course not surprising because of the sun worship of the Akhenaten family. Below is a close-up of the mummy with the two ouroboros serpents, one around the feet and one around the head, with a solar disk in his belly, and the ram headed bird inside of the solar disk. The ram headed bird is a symbol for the sun god Ra. Maybe also of interest is that this solar disk is at the level of the solar plexus chakra. It is rather unusual that the ouroboros serpent shows up not once but twice, and on the same figure. It is also quite unusual that the figure is so large, showing that he, or what he represents, is quite important. Some see the figure as Osiris and Ra. Osiris is then the god that dies, and is born again as the sun god Ra. But is is also possible that the figure is symbolic representation of the the dead pharaoh who is undergoing the rebirth process. This is furthermore enhanced by the ouroboros around the feet and around the head, which are the two ends of the body.